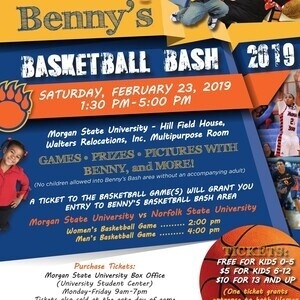 Show your support for MSU Athletics as the Bears take on Norfolk State University on Saturday, February 23, 2019! A ticket to the basketball game(s) will grant you entry to BENNY'S BASKETBALL BASH AREA - full of games, prizes, pictures with Benny, and more! All games are FREE for Morgan State with current Bear Card I.D.